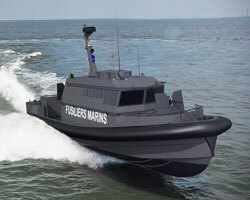 French military/patrol boat manufacturer UFAST has won an order to build 12 armoured high-speed interceptors for the country’s elite Force Maritime des Fusiliers Marins et Commandos (FORFUSCO) – effectively a ‘SWAT’-style division of the French Navy, which specialises in combatting seaborne criminals and terrorists and protecting key naval sites and vessels. Ten of the vessels in this order will be stationed at domestic French ports, including Brest, Cherbourg and Toulon. FORFUSCO will deploy the craft to provide bodyguard services for naval vessels entering and leaving said ports, as well as to fend off any terrorist threats from sea. Additionally, two of the series will be stationed at the French naval base in Djibouti, East Africa. All dozen vessels are based on Camarc’s Interceptor 15 class. Each will feature an overall length of 15m and a breadth of 4m, with the capacity to accommodate up to eight armed FORFUSCO operatives. The forthcoming UFAST units will be built in infused composite for superior strength, rigidity and resistance to corrosion, Camarc says. Each boat will be equipped with four outboards, rated 261kW apiece, granting her the ability to surpass the 40knot mark. In addition to incorporating ballistic protection into their designs, each of the forthcoming vessels will be heavily fendered, for maximum protection against the effects of high-speed collisions and having to ram target vessels. Firing stations, located at each boat’s front and aft, will house 12.7mm machine guns.